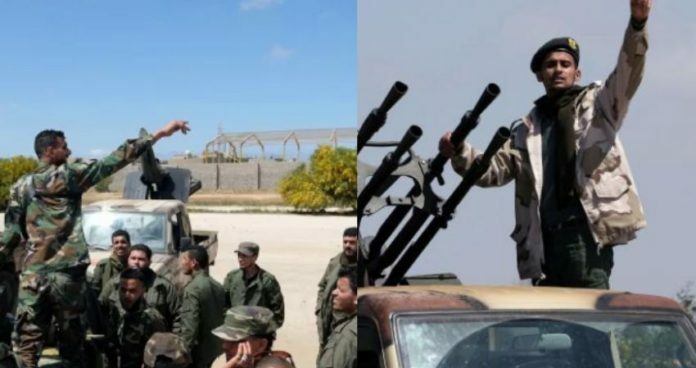 Libya’s Colonel Mohamed Gnounou in a press conference on Sunday announced that the forces loyal to the GNA (Government National Accord) have launched a counter-offensive to defend Tripoli from falling into the wrong hands. He further stated that the LNA (Libyan National Army) will face resistance on every step. Ever since, the downfall of Muhammad Gaddafi Libya has taken a turn for the worst. According to the media reports Libyan National Army (LNA) lead by Gen. Hifter launched an attack on Tripoli 4 days ago to liberate it from what he believed is an iligimate government of GNA founded by western power to promote and protect their interest in the region. To counter the LNA, the GNA has launched a counter-offensive called volcano of anger. The people are scared and terrified of the current situation. Those who can leave are fleeing the country while those who can’t have started stocking food and fuel in case the war prolongs. The UN mission in Libya (UNSMIL) urged both sides to call a truce for at least 2 hours so that the wounded and civilians could be evacuated. The UN sectary general António Guterres‏ while talking to the media said that military solution is not the answer to the current problem. Only intra –Libyan dialogue is the solution.He furthermore requested for both the sides to calm down and come to common terms. Countries all over the world have ordered the evacuation of all their citizens and personal in Libya due to the tension. The US Africa Command based in Germany ordered some of its personnel to evacuate the county due to the increasing tension. It is not exactly known how many personnel have been evacuated but videos showing USA navel assets leaving the country are going viral on social media. The G7 and the UN have condemned the LNA forces saying that they are getting in the way of progress and stabilizing Libya. The GNA backed forces have vowed to resist Gen. Hifter by all means possible.